Over two thirds (67%) of UK consumers go on to purchase products they discover on retailer’s social media channels, new research reveals. A study of 1,000 consumers aged between 18 and 65 by marketing technology company Curalate found that 46% spend time thinking about it then buy later online, while 17% will buy instore. 4% make the purchase immediately online after seeing the product. The 18-34 year olds surveyed were most receptive to shoppable social posts, with half of this age group agreeing they are interested in learning more about items they spot on social media sites. Overall, 39% of consumers were influenced by user generated content, saying real life images of people who had previously bought the product would make them more likely to make a purchase. A further 57% said they have been taken to unspecific website pages when clicking on individual products on social media. When asked about following brands on social media, Curalate's research found that 45% of female respondents did so, compared with 38% of males. Over half (56%) of 18-34 year olds engaged with brands on social channels, against 21% of 55-65 year olds. Meanwhile, a third of the sample said they would shop directly on a brand’s Facebook, Instagram, Twitter and Pinterest pages if they could use an easy payment system where their information was already saved. 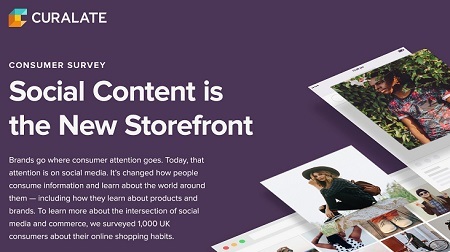 Curalate also surveyed 1,000 US consumers in conjunction with the UK study, and saw that a higher proportion were keeping up to date with their favourite brands on social media - 60% and 41% respectively. Answering whether they had seen a retail product on social media they were interested in learning more about, 63% of US respondents said yes, versus 40% here, suggesting US retailers are more actively enabling social shopping.